Some of this, I think should understand, is artifice. This is not the way the world is, not the world works, not the way people work within it. This is a school. This is a schoolhouse. I am a school teacher within it. I try to hallow its halls by getting those walking their lengths talking at lengths about things worth knowing and showing to the world. The only thing special about this place is the people. And you are the people. Emptied of you, this place has the mere residue of wonder. Some of this, I think you should understand, is artifice. The preceding “you” is not just you. It is “you all”‘. It is “all y’all'”. It is us all here in this room and in the next and in the next and in that building over there and that, on this campus, on The South Campus, on The More North Campus, everywhere The Medical School touches, all those places buzzing about that Michigan fervor. (If you will allow a brief aside to these poetic flourishes. I’ve once described us Michigan types as those just smart enough to go south for “warmer weather” but just crazy enough to keep going this far north. And if you need a metaphor that metaphor, consider our campuses.) Who you all are is something special and it is my job up here to harness all of that to give you a meaningful education. As such, I have been guided by the philosophy that follows, straying at times from my ideals, but pushing my way ever closer toward them, homing in forever on the true, right, and just. As such, some structure is needed. The structure of artifice has a name, and I speak it here. For those of you seeing what this whole speech thing is winding up to be and looking for both the Cliff’s Notes version of it and the exit door, I tidily put it thusly: what you are studying and the biomedical instruments you are developing are changing the way human beings fundamentally conceive of themselves. This is important work and it is important that we do it well. You should be proud, to the extent you did, the good work of which I know you are all capable. If you don’t feel like sitting through an hour long expounding of that theme, there is the door. This winter semester, we have all done our level best to cram our brains with as much information, models, data, evidence, technical gobbledeegook, lyrics of epic poetry, friends’ names, dates, jokes, spicy memes, hope for our future sports prospects and maybe, just maybe, a hobby or two with that overabundance of free time you all find yourself so burdened with. And we have done all this in conditions where the best said for any given length of time over the past hundred or so days was a week of gray and rain. We have gone through much and we will go through more. I lament only that as far as your biomedical instrumentation journey goes, you must now captain your own ship. Some, perhaps with a genius absent those of us studying the subject, seeing the seas, gladly and efficiently dock their boat, drop anchor, and give the keys to the first passerby. Some will go down with their ships, madly stabbing at hell’s heart, spitting their last breaths at thee. Most, most likely, will be somewhere in the between. Going with the flow to quantify the self of others. I think you will agree that while this is a lot, it is not all. Just as “you” are both “you all” and “all y’all”, you are not all. You are a part of it. And that’s something. That’s enough. But enough for today is only ever just so. There is still tomorrow to learn. Whether you have yet any sense for it, you’ve just stepped yourself into a Red Queen situation by studying this here field of biomedical engineering. “It takes all the running you can do, to keep in the same place. If you want to get somewhere else, you must run at least twice as fast as that.” Unlike the vector calculus employed by our mechanical engineering brethren and sistren, the dynamics of the biomedical condition are still being studied and written up. And here’s something we maybe don’t tell you enough: it’s going to be you doping the writing up. You all represent the future of this field and when we crack cancer, sort out gene therapy, and build devices that make people say, “they can do what, where now?”, I hope you all consider yourself a part of it. During your time here you’ve been taught by some of the best teachers on the subject the world has to offer. Indeed, I’ve taught you all that I know as best I could. But unfortunately, unlike many of you, they didn’t see fit to graduate me this year and so I’ve got to stick around, teaching ENGR 100 and BIOMEDE 231 in the fall and BIOMEDE 211 and 458 again next winter. And though I must remain, you are welcome into any of my classrooms at just about any time. And but so what I hope happens is that many of you go on to design solutions to biomedical problems that I can then go on to teach my future students. That’s sort of how all of this works: students learning from students. Some of this, I think should understand, is artifice. I am not the one doing the teaching. Rather, we are all doing the learning. If you have enjoyed this class and/or its laboratory component, I suspect it has little to do with my instruction, which often overwordy and frenetic, present speech included. No, it is because I try to make possible as many opportunities for others to have the floor as possible. The schoolteacher is rarely the one you learn from. I try, but I am but a schoolteacher. You learn from each other. You know this. You learned it from each other. because I am involved in [hu]mankind. For all my years of doing this, I have found two answers for what ultimately brings us to this room, two reason which ultimately drive us into biomedical engineering. Either (1) we have had some person, deeply affecting confrontation along the biomedical landscape (e.g., mom had cancer, dad lost a leg, etc. ), and/or (2) we have a deep and abiding fascination with the sheer mechanics of the mechanism (tinkerers of the watchmakers handiwork). What blossoms well within the particular meadows of biomedical instrumentation are myriad metrologies of humanity. Ways to measure how the heart beats, how the lungs breathes, how the oxygen saturates within our very blood, these are ways of conceiving the the self (and its inner works) distinct from most others developed in pursuit of other human endeavors. And they are possible only if the engineers developing these methods, means, and mechanisms of medical technology have both (1) a fundamental understanding of the human body as a biological, chemical, and physical animal pulsating with the rhythms of history and going with the flow of the now and (2) the ability to leverage the laws and literatures of the biological, chemical, and physical sciences to aid as many of those human bodies that we can. I hope I do not speak out of turn or insufficiently for the rest of us, but I think you will agree that you do not go into this field unless you want to help. Those hoping to merely coast, there again is the door. What we are are here to do is different from what others do. The fields of our profession and the meadows of our subdiscipline offer more twists and turns than are present in a typical engineer’s education. Say what you will, but it is much easier to predict the swing of a pendulum, the transfer of heat in an engine, the flow of water along a pipe than it is know how are legs walk, how are hearts beat, how our blood flows. In disciplines hewing more to simply physical, the task is simpler, when experimenting, the questions are easier. How does it fall? When does it rise? Where does it go? But when “it” is a fellow human being, how are we to measure? One way is to have attended this class, taken copious notes, and spent as much time as you could stomach down in the instrumentation lab building, testing, and analyzing devices which can measure human parameters, to in some manner quantify “the self”. Not to put too fine a point on it, but what we are doing here is drastically reframing “what it means to be human”. The notion that a human being could be described in some useful manner by the beating of their heart, the breathing of their lungs, the oxygen of the blood, the dipoles of their eyes, the waves of their brain, the potential of their muscles, the composition of their body is a new and radical notion in human history. This is not the way it has always been. Yet, from our perches here in the ivory tower, we can have some sense of what it might be. The future of medical devices sits in a finite number of rooms. One of those rooms is this one. What the field becomes, how good our medical instruments are, will rest on you. It is your world to make and shape and put the way you want. Because I think what we do is quite literally of vital importance I think you all should take it seriously, do your best, and continue to learn from others other/newer/different ways of doing it. We human beings are going through quite a transition in self-conception. 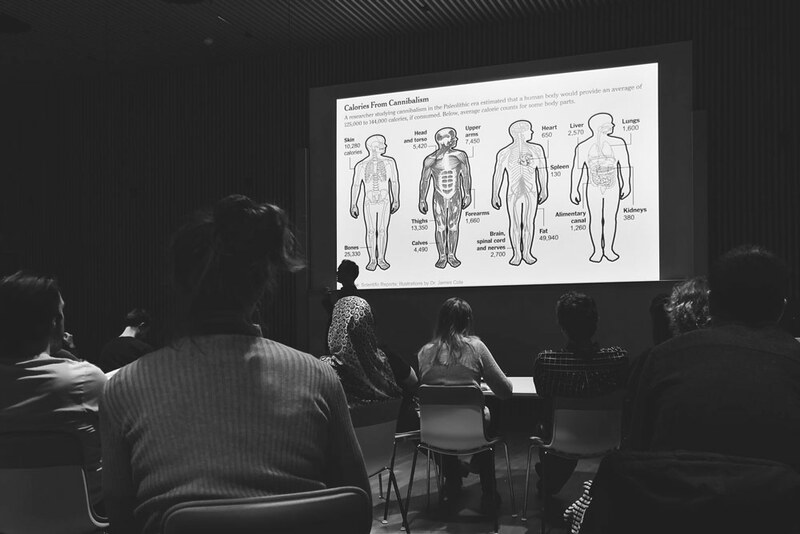 From the manifestation of our “human condition” from the renaissance to the second World War, we as a global society are reframing “what it means to be human” by our “biomedical condition”. And it will be people rooms like this one that ensure precise and accurate measures of the true and beautiful and biomedical. a “one man electromyography band”. Each of these projects demonstrate that the skills you have acquired, you could put to some mild and worthwhile purpose. Even if it’s just playing pong. The triumphs and heartaches one must experience on our way to child’s play is not abnormal. It takes a lot of hard work for something to make something easy. But more than just the technical skills imparted, I believe a class like this teaches you something more existentially fundamental: how to take your own measure. See, a class like this is meant to test your mettle. The central conceit is that we stick you in a room, say “here’s some electronics”, and we see what you can do. In that process you experience design and debug some moderately complicated biomedical instrumentation while battling the pixies that whirl around nothing but chaos and pondering the gentle stillness of fully saturated op amps. All the while, you have gotten to see what you are made of. Though you are now the ones creating the measuring tools, you will discover that some measurements can’t be taken. Or those that can, don’t reveal the truth within. You are no taller at the mountain top, no shorter in the meadow. You have achieved much here and I know you can achieve more. Number sixteen (16), A. S. Mr. S. has the distinction of being the first to complete the Belmont Triple Crown. Though, several of you have had me for a few classes, A. walked into my ENGR 100 class his first year here with his head held high, strolled into my BIOMEDE 211 class holding his head higher, and he’s walking out of this class with it held even higher. You have learned a great deal and I hope to have aided that learning in some way. May you keep learning from this day on. Number one-hundred fourteen (114), K. Y. Another Triple Crown, K. has been instrumental to the in-class dialogue of 211, 241, and 458 and I am not alone in appreciating his tireless input into these classes and no doubt others. May you continue to foster the intellectual camaraderie of your peers. Number one-hundred fifteen (115), M. K. Yet another. Taking a different tact than that of Mr. Y, you, M., tend more toward the quiet, competent type than the loud boisterous members in our midst. As you will find in life, talent speaks for itself. May your abilities say all that you need. Number one-hundred sixteen (116), R. A. It takes a certain kind of crazy, a certain amount of smarts, and more than a small dash of patience to succeed here, in medical school, and in life. Though I can only speak to your performance here, it bodes well for your future prospects. May you always keep that balance. Number one-hundred seventeen (117), E. B. You are the reason I know Michigan sports half as well as I do. Coming into those afternoon sections I knew I better have my stats ready. This speaks, if but tangentially, to a natural “teamfulness” you seem to bring to situations. Where ever you are, you seem to always be part of the team. May you always play on the right team. And Go Blue! Number one-hundred twenty-two (122), T. H. In the first sentence of one of your first Big List submissions, I have you down as once writing that some device “was created to optimize the cholangiopancreatoscopy procedural process” and the mere fact that such a concept could be understood and communicated is nothing short of astounding. And this is but one of the many ways in which you have shone brightly. May you continue to astound. Number one-hundred twenty-three (123), R. H. I have noticed that at least in my classes you tend to reside in the quieter meadows of our landscape. Whether it be in 211, 241, or here, where you reside, reflects something of who you are. You are, who you surround yourself with. May you be a peer to those you wish to be a peer to you. Number one-hundred twenty-eight (128), E. E. In the first one of these I remarked that “You ha[d] the single nicest looking homeworks I [had] seen all year.” I noted that “Such good work consistently demonstrated, even for things as simple as homework, demonstrates consistently good abilities.” I still hold to this as your work has continued to improve time and again. May you ever possess and improve such faculties. Number one-hundred twenty-nine (129), D. H. Upon entering the first class I had him in, D. confidently declared to all in the room that he was going to be bringing the fannypack back. And while I don’t those fannypacks coming back any time soon, it has been good these past three semesters to see you back again and again. May you always find a way to comeback. Number one-hundred thirty-one (131), B. R. I have had the privilege of seeing you take your first circuits notes way back (almost 500 days ago) and watching you put together, test, and debug real actual biomedical instruments. Seeing your trajectory is the reason folks like me get out of bed, type up a speech, and want to do it all over again. May you continue to progress and inspire others to do the same. Number one-hundred thirty-six (136), E. S. It takes a special kind of person, who, having just felt an electric jolt, places the electrodes back on their head. In my mind it is akin to the physics teacher and the bowling ball pendulum. If you know how it works, you have nothing to fear. Such confidence, I hope you hold in your chest. May you be fearless all the rest of your days. Number two-hundred sixty-four (264), T. P. Not to express any sort of preference or favoritism in the assessing of assignments, but I did have something approaching eagerness regarding your Big List submissions. On the one hand, it was great to learn about a whole segment of medical technology that I am woefully ignorant of (sports medicine, athletic training), on the other, I worried each time of what new injury befell you. But, you’re still here and Nietzsche reminds of the strength that comes from adversity. All this to say, may you stop hurting yourself so much, but continue on in your biomedical engineering pursuits. Number two-hundred sixty-six (266), N. B. Rare is it for me to compliment someone here for work they did in another class, but I have to admit your functioning child’s wheelchair is one of the coolest things I’ve gotten to see this semester. Sorry to say we can’t claim all the credit for it here, but I hope some of the electronics skills you learned here carried over effectively. All the same, may you ably help the disabled and care for those who need it. Number two-hundred sixty-eight (268), Z. S. It goes to show that though I learn to know a bit about each and everyone of you while here, it’s in the hallways where we can sometimes be known best. Outside of this class I have learned that you have done a great deal outside of this class including volunteering at Veterans Affairs hospitals and with the Red Cross. May you continue to hold important both what you have learned in this class and what you have learned out of it. Number two-hundred seventy-one (271), L. E. I particularly enjoyed your Big List summary of the torniquet, where in addition to explaining its basic function and purpose, you go on to situate its use in everything from “the conquests of Alexander the Great” to the microprocessor controlled modern day versions. Such contextualizing I believe aids in understanding. Indeed, I have tried much the same myself. May you find the context which best suits you. Number two-hundred seventy-two (272), A. J. Affable, driven, sometimes funny, I hope you take no offense in me deeming you one of the friendliest people I have met. You are a natural on a team and a confidant one-on-one. As you journey through your biomedical landscape, may you ever find yourself among friends. Number two-hundred seventy-three (273), T. L. No one in this room knows better the this true and fundamental fact: you either run with The Pack or you run from The Pack. And though we both be far from “Home Means Nevada”, you, I, and all of us here have grown closer in the larger biomedical community. Home, as they say, is where the heart is. May you continue to improve the pack and find your heart at home. Number two-hundred seventy-four (274), A. M. I didn’t know what quite to expect when I first put together the Big List assignment. While most appear to have submitted random devices, your were one to stick to a theme writing up summaries for dental implants, dental cone beam computed tomography, an electronic apex locator, and dental curing lights. Sounds like you’ve got an interest in teeth. And that’s good because for most of human history poor dental hygiene was killing most people. May you continue to have an interest in the smiles of others. Number two-hundred seventy-five (275), D. R. Few are those as motivated as you to help as much as you do. Whether it’s for client-based projects, bioethical discussions, STEM outreach, or taking a gamble with the Michigan Wearable, you possess a preternaturally helpful disposition. May you continue to help all you can. Number two-hundred seventy-six (276), J. S. As among the first and the few to complete a Michigan Wearable assignment, thank you for your efforts. As you have no doubt begun to appreciate, there is an inherent “fog of war” within experimentation. And our attempt at that assignment, well, it was plenty foggy. Yet, you were the first to brave the unknown and there is something to be said for that. May you continue boldly on to greet the unknown. Number two-hundred seventy-seven (277), J. S. I am assigning you the Softest EOG Mask For Newborns To Track REM-Cycle Sleep Award. While perhaps a small prize, it is well earned. I have seen you deftly handle hardware, software, and importantly (both in this class and in the last) laboratory documentation. May you continue to be adept at all you handle. Number two-hundred seventy-eight (278), J. S. There is a special place in an instructor’s heart for those who sit in the front row. There is also a special place in an instructor’s heart for those who actively participate in the class-wide dialogue (again, we best learn from each other). Have occupied both roles, let me say that my heart is glad of it. May yours guide you well in the future as you find a place near the front to share. Number two-hundred eighty-two (282), M. W. I once wrote of you, “In all of [her] endeavors, she has demonstrated a knack for problem solving and team building. M. truly does embody what we might call the leaders and the best that we expect of this university.” As a fixture in M-HEAL and with an eye towards global health, may you continue to lead and be the best of us. Number two-hundred eighty-four (284), E. F. Last year I said of you in that long, rambling speech, that were a ”consistent participant in our laboratory exercises and seem much appreciated by your team mates.” Thus far I have been presented with no evidence to the contrary that you work well with others and others, when working with you, do well. May you and all those you partner with do well and do good. Number two-hundred eighty-seven (287), C. N. Good humor and a good skill base will get you far in life. Better humor and better skills will get you farther. In the academic year that I have gotten to know you, you seem only ever to be improving in each. May you continue to better what you are good at and laugh at the rest. Number two-hundred eighty-nine (289), C. P. When last I was singing your praises up here I was underlining your observation that “everything in America is ‘awesome'”. Again, you are goddamned it is. But, that is due in large part to welcoming awesome people like you from around the world to make it so. When you leave for your eventually-to-be-Brexited home, carry with you all the best that you have learned here and may it make you awesome, wherever you go. Number two-hundred ninety (290), B. K. To spare you a quote from Socrates this time, allow me to say that there is always something to admire in the person willing to be the test subject. There is often risk, with minimal direct reward. It is the prerogative of the charitable. As I have seen you hook yourself up with all manner of electrodes for every team you have been a part, you have shown yourself to be a selfless self, here to help. May you continue to help others as you test yourself. Number two-hundred ninety-three (293), J. L. A woman after my own heart, quite literally. You were the first (and only so far as I can tell!) person to submit a wearable medical device, in fact the first clinical grade personal electrocardiogram approved by the FDA (happening just a couple of years back). Understanding that cut edge is necessary here out in the biomedical frontier. Your concise and precise distillation of the current will serve you well in the future. May you continue your concision. Number two-hundred ninety-four (294), R. L. You have shown yourself to be a woman dedicated. Every extra hour I saw your team in the lab, I saw you there. Every extra effort, I saw you push. Every little thing, I saw you take a big swing at. And while we do not always connect with the ball (that bioimpedance sensor has been a lot of fun, hasn’t it? ), stepping up to the place is the first thing you got to do. May you continue to dedicate yourself every time you step up. Number two-hundred ninety-five (295), K. F. I hope you got to play around with that Argus II system to your heart’s content. While I have tried here to give you as much exposure to “real world” medical instrumentation, there is nothing that can substitute for “real world” experience. (Again, some of this, I think you should understand, is artifice.) May you continue to learn from the “real world” and do what you can to make it a little bit better. Number two-hundred ninety-six (296), M. M. Not to say that there is a difference between the work ethic of undergraduate students and graduate students, but there is a difference between the work ethic of undergraduate students and graduates students and you, M., embody it well. Even the to casual observer it is obvious that you are a serious thinker and doer. What you set your mind to achieve stands little chance of not being achieved. May you advance to your candidacy, pass your defense, and go on to do any and all great things you set your mind to. Number two-hundred ninety-seven (297), M. O. I know I didn’t give any template for how to submit things to the Big List, but you created order where there was none, turning in clean, clear, and well laid out information regarding your devices. Such a spontaneous ordering of thoughts to achieve worthy ends is what we’re all after here. And as you go after it, may you calm the chaos and keep steady your ship. Number two-hundred ninety-eight (298), A. P. While I hope you have learned much here, I suspect you’ve learned much elsewhere. Having presented your own research at an academic surgical conference in Texas, while balancing your responsibilities to the rest of your teammate’s within the first month of classes, shows that you probably knew a lot before entering this classroom. All this to say, you are shaping up to be a mighty fine biomedical engineer. May you do that and more in the future you want. Number two-hundred ninety-six (299), M. K. I have gotten the chance to see your skills in a number of arenas. I’ve seen you swiftly handle even my trickiest questions during share-outs, I have gotten to see the work you have conducted with Scott Lempka and Tim Bruns in microposter format, and I have seen what you have made in our laboratory. And in each case it echoes your belief that “we learn better when we work to solve problems ourselves.” May you continue to learn by solving as many problems as you can. Number three-hundred (300), H. S. A reserved fixture in this class, I have found that you are not a man to mince words, saying it straight, “telling the truth the best way that [you’re] able”. One finds, the more one goes along, that those saying few words are not saying little. May we continue to hear from you. Number three-hundred one (301), R. S. Though the second Rachel on this list, you are second to none in your efforts here. As continue on in your Master’s may you master the material with effort, not burden. Number three-hundred two (302), D. C. You are a man driven. You are a man driving. You will get where you are going, of that I have no doubt. It is my hope to have taught you something of what you ought to do once you get there. The rest is up to you. May you enjoy the journey as well as the destination. Number three-hundred three (303), A. K. Your Big List discussion on radiofrequency ablation was well articulated and interest generating. Though you stated starkly that such devices are “used to destroy tissue” you quickly noted that it is meant to remove what is unwanted while keeping the rest.May you remove from you life all that is unwanted and just keep the rest. Number three-hundred four (304), R. D. In explaining why you wished the homework question you proposed should be included you said that “after completing lab 1 I had a pretty good idea of how to measure the electrical activity of the heart”, yet you wished to know more about the role of electrodes in this whole system. It takes a keen eye to observe the happenings at the interface, be it between electrodes and skin or this room and the next. May you continue to refine your keenness. Number three-hundred five (305), J. G. A man determined is a hell of thing. Those who peer to the horizon with some sense of how they might seize it, those are the types we want in this room. You have been a man with a plan from the moment you walked through the door. And I can appreciate that. May others do as well. Number three-hundred six (306), L. H. Odd as it is to call out, I believe your in-class explanation of venous pressure measurements systems was among the best I have ever heard. Having spent some time in this space, I’ve heard many explanations of why the measurements are important, how they are typically measured, and what sort of problems arise. And yours was right there at the top of it. May you your ascent to the peaks in front of you. Number three-hundred seven (307), A. B. Not that it’s a contest or anything, but I think your submissions to the Big List had the consistently best names in my mind, including: ECMO, Hemolung, an acetabular system, NERVANA, FallSkip, and iPill. It’s a skill to identify the poetry of the art, but you seem to have a natural affinity for it. May you continue to find the grander poetry of the routinely mundane. Number three-hundred eight (308), M. C. In your loop of the hospital you noticed a lot of “doctors”, “nurses”, “patients”, “security guards”, “art”, “landmarks”, “ways of getting lost”, and “the dog Bambi that [the hospital has] that goes around the hospital giving comfort”. Being able to take in the intimate details of the larger whole is a true talent. May you continue to see the trees and the forest well. Number three-hundred nine (309), M. C. To have an opinion — the mind to conceive it, the heart to express it, the liberty to share it — to have an opinion is one of the most useful things a person can have. (Consider its mere inverse, the consolations of the naive.) To have an opinion on markets in healthcare is one damn interesting and useful opinion to have. May you continue to hone yours and share with all you can. Number three-hundred ten (310), K. G. Though I have down as saying that you “did enjoy finding out more about Michigan healthcare” during your tour of the hospital, I think it was also important for you to discover that you “really don’t enjoy hospitals, [e]specially the hectic atmosphere of the ER[, which you] found  anxiety inducing.” Indeed it is quite one thing to “know the truth” of something (doctors assess patients, send for tests, analyze results, consult with colleagues, and document the whole thing) and quite another to “know the reality” of it. I hope this class has enabled you to know both. May you know that and more. Number three-hundred eleven (311), J. R. Though strictly anonymous, your single spirometric data point shifted the classes curve significantly. That kind of influence emphasizes what sort of singular individual you are. May you continue to stand above the crowd and find yourself there. Number three-hundred twelve (312), L. V. You are one of those strong, quiet types in this class, competently and confidently putting out quality work with few extraneous words. As a man of many extraneous words, I can only sit and admire your fortitude (and your grade). May you continue on in confidence. Number three-hundred thirteen (313), A. V. I credit much of the future success of the Michigan Wearable as an assignment in this class to your clever module-based solution. It’s one of those clear strokes of genius that forces folks like me to smack our forehands and cry to the heavens, “why didn’t I think of that? '” May you continue to have such clever ideas. Number three-hundred fourteen (314), M. Y. You were the first to discover that you could complete the Big List assignment quickly, submitting twice the first time and knocking it out the second. Taking chances to improve and expedite outcomes is our job description. May you continue to discover as many ways as you can to efficiently solve the problems before you. Number three-hundred fifteen (315), A. G. Not that there was any right or wrong way to go on the tour of the hospital, but I think your version of it probably ranks among the better of it. We do not all get to see Big Bird in our journeys. Indeed, we best heed Big Bird’s wise words such as “asking questions is a good way of finding things out” and “it’s better to be who you are, turns out people like you best that way”. May you continue to find the unique in your journey, ask questions along the way, and be who you want all the while. Number three-hundred sixteen (316), R. K. As someone whose work often has the appearance of disjointed chicken scratch, I must admit that the clear ordering of your thoughts on homework (as seen here), in the middle of debugging, and during share-outs has me envious. This is a skill that will serve you all the rest of your days. May you continue to make clear the order of your thoughts to all who hear them. Number three-hundred seventeen (317), Z. Z. I hope your “real world” exposure to actual ambulatory medicine has been complemented by the technical content you’ve learned here: how the devices work, what can be done when they don’t, how to make better ones. But an important part of that, namely patience in the face of the unknown, you already have in spades. May you continue to help those in need of it, ever surer of your abilities. Number three-hundred eighteen (318), V. M. I hope some of the skills you’ve developed here can carryover into your instrumented van. Moreover, I hope the ponderings on extinction shared over salad with L. and a couple of researchers, complements your education here. We are working to prevent that. How? May you always find an answer. Number three-hundred nineteen (319), S. S. Your personal experience with medical technologies is profoundly more intimate than can be provided within the confines of this classroom, this schoolhouse. That you have taken what you know to be true, to be real, and to be experienced and combined them effectively in the design of your own medical device, speaks to skills I hope you continue to develop. May you always know what is true and real and experience nothing less than the best in life. Number three-hundred twenty (320), T. R. As a Ph.D (pre-)candidate, I expect that I will see you around these parts for the days and years to come. Thus, in this case, I offer no “good bye”, but a “see you next time'” At that time I’d like to hear about your research, your time in Ann Arbor, see who you’re shaping up to be. To that end, may you be who you want, learn what you need, and help all you can. Number three-hundred twenty-one (321), M. P. I do not envy anyone having to take this class with no prior electronics experience. It’s been awhile since I’ve read Dante, but if I remember right that was a facet of one of the first rings of Hell. Yet, for all the struggle that must have accompanied your journey through this class, I have never seen it affect your disposition or your work product. May you continue to keep a steady course wherever you may roam. Number three-hundred twenty-two (322), A. A. Another woman after my own heart, I have you down as once saying that you “really liked learning about electrodes are used in a more chemical sense, […] pH electrodes, polarizable/non-polarizable electrodes & how redox equations & Nernst potential play a role.” In fact, it was my own revelations regarding the electrode/electrolyte interactions in an electrochemical sense that sent me along many of my own research avenues. May you find you like more the more you learn. Number three-hundred twenty-three (323), S. O. Considering that only within the past month have I learned that you prefer K., I feel I still have much to know you. The hundred days bounding this class frame only a moment in time of the woman known as K. May you continue to prompt others to know you further. Number three-hundred twenty-four (324), M. H. How a person manages to get into both this class and its genuinely required prerequisite class (BIOMEDE 241) speaks to a persistence and fortitude found in few. May you continue on your own path just as surefootedly as you walked in this door. Number three-hundred twenty-five (325), S. E. It’s amazing the things you can learn about a person from a single email signature. And though you might not brag on it here, allow me to say that I think the fact that you have been able to do what you do here in this class while simultaneously serving as President of Michigan’s chapter of the Student Veterans of America and as a Peer Advisor over in the ECE Department is nothing short of incredible. May you continue to serve ably in all you apply yourself to. Number three-hundred twenty-six (326), W. L. I especially appreciated your summary and discussion of CardioMEMS™ HF System the first FDA-approved wireless heart failure monitor. You note only discussed the human impact the device has, but when to great lengths to explain how the a hermetically sealed capsule containing an inductor coil and a pressure-sensitive capacitor, whose resonant frequency changes with blood pressure. Being able to hold both the human and the technical, both the biomedical and the engineer, in your head is what puts us all in this room. May you continue to understand both the human and the technical. Number three-hundred twenty-seven (327), J. B. In you I see emphasized the focusing of effort we all go through within the semester. Starting off by describing a “centrifuge” as your first Big List device, you finished by summarizing the “Visian Toric ICL artificial lens”. Which is to say, that you, we, have gone from not quite knowing what it is we were looking for or supposed to be doing to competently communicating to one of skill in the art key aspects of a modern medical instrument. Having done this much, I am not sure what further I can do to help you. You are now beyond me. May you to hone your focus and go beyond what others envision. Number three-hundred twenty-eight (328), N. D. I am sorry to hear of your recent tragedy. I am sorry further to say that life ahead of you has many such tragedies. We are beset on all sides with fortune and misfortune, destiny and chance, happenstance and circumstance. To find or to mine or to create some kind of purpose in all of this is the unspoken task assigned to each of us at birth, perhaps sooner. To do so with friends and family is one of life’s chief joys. May you continue to cherish both. That’s it. That was us. That was the class. The class this year was very different from years past. Very different. Those of you who may have snuck a peak at previous years’ materials or heard through grapevine what this class was about, may have been shocked from the outset that we were even trying to visit a hospital. The teams have never been broken up this way. There’s never been such a thing as The Big List of Medical Devices until you all made it. No one read the book chapters before or explained any part of them in class. There were only five (5) lectures in previous classes. Here I’ve subjected you nine (9) and four extra lecture times where you as students were primarily responsible for the discussions had, the information conveyed, and the things learned. Oh, and that’s another thing that was new: having to go out and talk to actual (bio)medical professionals about something, anything, about biomedical technology, whether it be on businesses, intellectual property, regulation, or consultation. And you had to find real world news related to your proposed project idea. And you had to discuss that article with others around you. You had to do so very much more than anyone’s ever been asked to do in this class and you have (for the most part) done it with aplomb. When asked the hard questions, you have learned how to give concise answers. (Do not say more when less will do.) When tasked with hard problems, you have started to give viable solutions. And for now, that’ll be enough. Tomorrow, try to do better. All the same, I hope you are proud of what you have achieved. With that, I thank you for the opportunity to dismiss this class one final time. I hope you all do well on your fast approaching exams and on your ever-to-the-horizon journeys. I have done what I can for you here and I trust that you can do more. Good luck. Death by a thousand clicks? Death to a thousand clicks! The internet has not made everything better. While not a controversial opinion, it tends to bin one in with the Luddites and seems to keep the technocrats (those most needing to hear it) from hearing it. Very rarely in life is an app the answer. Rarely is it even an answer. Digitization does not mean progress. More data does not equal more better. To wit, the recent investigation by Kaiser Health News and Fortune Magazine indicating that the average physician in America is feeling overburdened by the clicks, clacks, and clatter of the modern electronic health record and that this is leading to direct and quantifiable harms to patients. Though over $36 billion have been spent to bring to fruition that potential of the net-connected health record, it has led to fraud and cover-up, burdens and “by accident” treatment. More than anything, it has changed what the job of a physician is without asking or telling anybody. I have in mind this single fact, quoting from a 2013 paper from the American Journal of Emergency Medicine: “physicians spend significantly more time entering data into electronic medical records than on any other activity, including direct patient care“. The job of a doctor has gone from “treating patients” to “recording treatments given to patients”. Consider the graph seen below, showing the adoption of electronic health records the moment federal funds became tied to their use. Ten years ago, twenty years ago, when all these doctors heading out to that “real world” were first thinking about becoming doctors, this was not an aspect of medicine. While documenting cases has always been part and parcel of the profession, the temporal dominance of the activity in practice is only a recent phenomenon. According to the same 2013 study referenced above, an average physician spends approximately 28% of their time directly treating patients, 12% of their time reviewing test results and records, 13% of their time in discussion with colleagues, and 44% on data entry. What was meant to streamline the process of documentation and to make that documentation more easily accessible to doctors has had the unintended consequence of turning our highly trained medical professionals into data entry specialists. It’s not the job they signed up for and frankly it’s not the job they should be doing. When one learns that the average number of mouse clicks performed by an emergency medicine physician approaches 4,000 during any given day and when one recognizes the fact that almost no one can do something 4,000 times without error (and certainly not those tasked with saving the precarious lives of our most vulnerable patients), then it dawns on us: this isn’t the way it should work. This goes to the larger discussion of how healthcare centers in our country ought to work. Indeed, how health ought to be preached and practiced in the country as a whole. And if this the sort of discussion you’d like to have, please consider a spot at table for the upcoming Universal Healthcare Group talks. Let’s figure out ways in which data can get to where it needs without human arbitration. Let’s figure out what needs a doctor’s script and what scripts can help out doctors. Let’s figure out how to get patients in front of caretakers, instead of screens in front of each. Across the street from the Lurie Biomedical Engineering building (which houses my academic Department) is the Bentley Historical Library. Within its hallowed walls (or nearby) are lots and lots and lots of University archives. Included in those archives are Clarence Cook Little’s (“C. C. Little’s”) correspondence. By dipping our toe into that correspondence, we can see some of the passions and pursuits that occupied the mind of the man at the top (he was the 6th President of the University of Michigan, from 1925-1929). Found within that correspondence, is a pamphlet from the American Eugenics Society from 1927 (smack dab in the middle of Little’s presidency). Within that pamphlet we are told of the mission of the society. As reported the aims included the promotion of eugenics based research, education, legislation, and administration. Among the several committees the Society put together (including but not limited to committees on “organization”, “selective immigration”, “the history and survey of the eugenics movement”, “popular education”, “finance”, “biologic genealogy”, “crime prevention”, “”cooperation with clergymen”, “research”, “cooperation with social workers”, and “cooperation with physicians”), sandwiched between the “Committee on Legislation” and the “Committee on Eugenics and Dysgenics of Birth Regulation”, was one “Committee on Formal or Scholastic Education” chaired by none other than “Pres. C. C. Little”. “square eugenics with rational democratic ideals, by exposing false claims of class superiority and espousing equal opportunity demonstrate intrinsic merit”. Following these and other detailed plans to make eugenics a palatable notion to the masses, the author(s) of the pamphlet go on to make the case that eugenics is “eminently practical”. And in a statement that sounds as if it could have been plucked from the current cultural ether on the matter, an anonymous associate of the Society is quoted as claiming that “You will never be able to make eugenics popular until you can make the man in the street feel the pinch of the defective classes on his pocketbook”. As all that is old is new again, let us not forget that we have history as counsel for our future endeavors. Put another way, are we ever really having a “new” conversation about “who ought to be here” or is such a discussion part of the dialogue which started millennia before us? If we answer well, we might have millennia yet ahead to ponder further. Every now and then, people who actually know what they’re talking about talk out loud to the rest of us. From that, we can learn a thing or two. Below are two great demonstrations of communicating technical content to a lay-er audiences. Ever exhibited on the blood-stained theatre of human action. That rebellion to tyrants is obedience to god. Among the stranger of the arcana I’ve recently come cross: a music video from the Christian rap group the man currently standing accused of impregnating a woman previously described as in a “persistent vegetative state” who gave birth in the last few days of 2018 to a child matching the man’s DNA. The song’s central premise that “you’re just a certified, gold-plated, fake face” is perhaps too on the nose, given the “mask of normalcy” the man has worn in public for (allegedly) at least a year now. My local point to this cosmic tragedy is this: should I find any students developing medical devices bound for Guatemala suggesting to include polystyrene which was responsible for “searing the flesh and muting the cries with noxious smoke” of 56 girls locked in a room, I’ll be more than a little upset about it.